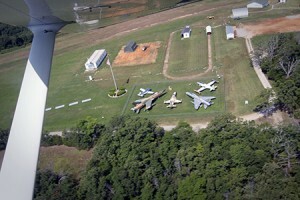 Silver Wings Field is Eureka Springs’ only airport. Feel free to visit Aviation Cadet World by land or by air. Just call ahead. 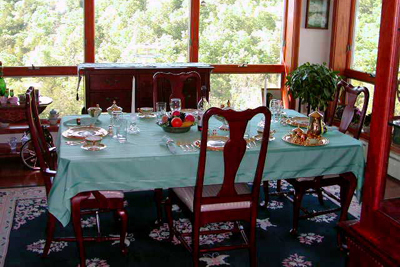 Brigadoon,Bed and Breakfast provides overnight accommodations in a delightful setting just down the mountain from the Aviation Cadet World property. 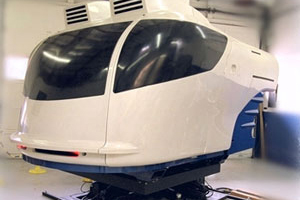 Take to the skies with the Sim Cab with “AeroBall” game. This is the only example of this simulator in existence. Original cost was over 3 million dollars. 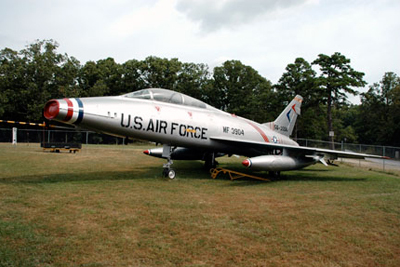 Part of a family of widely-used light supersonic fighter aircraft, designed and built by Northrop. 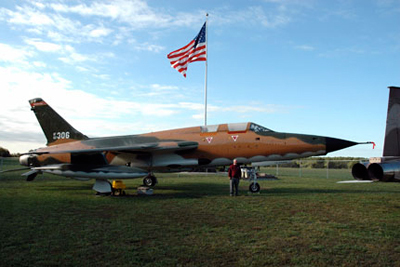 The Republic F-105 Thunderchief, was a supersonic fighter-bomber used by the United States Air Force. The first of the Century Series collection of USAF jet fighters, it was the first USAF fighter capable of supersonic speed in level flight. 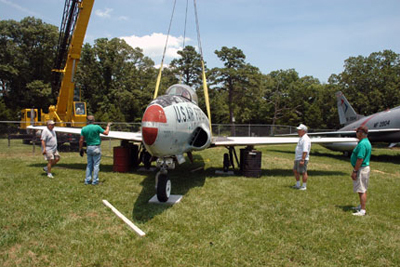 The Lockheed T-33 Shooting Star is an American-built jet trainer aircraft. Despite its vintage, the venerable T-33 still remains in service worldwide. See what NEW Attractions, upgrades, and events are going on. PLUS, "Blasts from the Past" features and more on our News/Blog page. The T-34-A and -B (which this aircraft is) was used by the air force and the navy for primary training. They also were used by various base aero clubs. 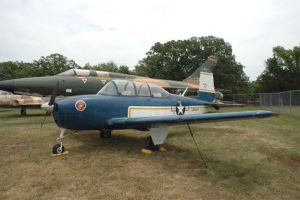 This L-16 was built in 1947 and was a United States Air Forces liaison bird. Some were used in Korea. Welcome to the one and only live one-man show to entertain and teach the history of the men who built the air arm of this nation. 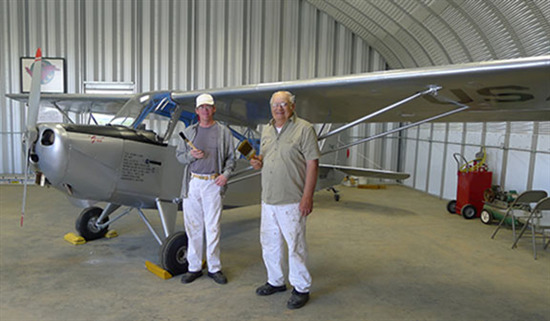 Most of you have never even heard about the Aviation Cadet program, even though you most likely have at least one relative who was involved in this great training program. 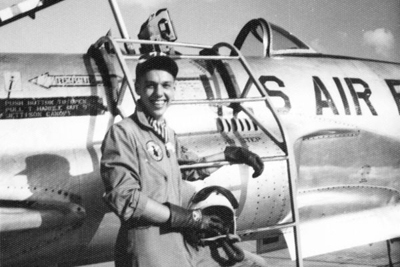 Errol D. Severe was a member of Aviation Cadet class 61-E, graduating as a pilot, from Vance AFB in January of 1961. He went on to fly for Delta Airlines and retired as a 727 Captain in 1985. 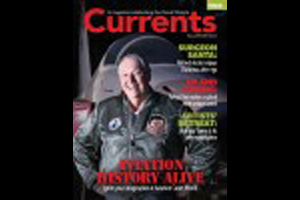 Captain Severe is one of, if not, the foremost authority on the Flying/Aviation Cadet program in the world. 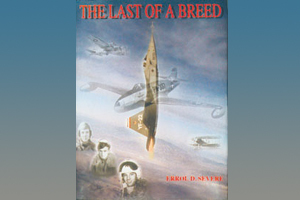 He wrote the Last of a Breed, the only book on the entire Flying/Aviation Cadet program in what eventually became the United States Air Force. You will not only be entertained by his whit and knowledge, you will be able to sit in the cockpit of a Vietnam era F-105 F/G Wild Weasel aircraft which actually served in Vietnam during the war. 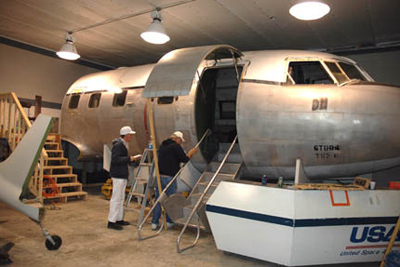 You will be allowed to enter the forward section of a Convair T-29 flying classroom used to train our navigators. This is the only original display of its type anywhere. When we have groups, we will launch the space shuttle (at least a video of an actually launch) while viewing the actual firing room consoles used at Cape Kennedy. The sound system will make the launch even more exciting. 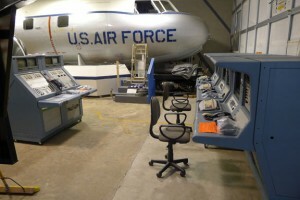 We also have an Air National Guard F-16 simulator that you can view, and fly with a reservation and additional cost. 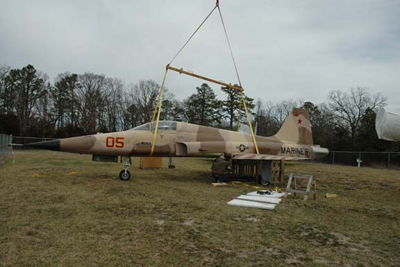 In our “Plane Pen” we have a complete F-105 F/G, T-34, F-5, F-100 and a T-33 all on display. As you can see, this is not a dry “museum,” it is an entertainment center which has pleased most all who have been here, men, woman, and children. We run three shows per day during the week (10:00, 13:00 and 15:00) on Saturday we run two shows (13:00 and 15:00) on Sunday we run only one show (15:00). You must make reservations before coming, please call 479-253-5008. We do not take credit cards and ask that in case something comes up and you cannot make your reservation, you take a moment to call and let us know. The show will be 1:30-2:00 in length. 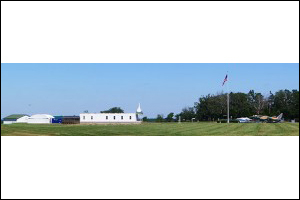 The cost of admission is: $15:00 for adults, $7.00 children 6-12, younger, free. 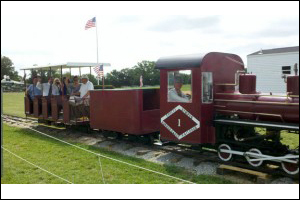 Please call now, as we have limited availability for each show which includes touring the eureka railroad museum and a ride on the eureka narrow gauge train during normal season.